Male: 18-44 (55 for officers) years of age for compulsory military service. Female: 18 years of age for military service. Compulsory for females born in 2000 or later. The Norwegian Armed Forces (Norwegian: Forsvaret, "The Defence") is the military organisation responsible for the defence of Norway. It consists of four branches, the Norwegian Army, the Royal Norwegian Navy, which includes the Coast Guard, the Royal Norwegian Air Force, and the Home Guard, as well as several joint departments. The military force in peace time is around 16,048 personnel including military and civilian staff, and around 63,318 in total with the current military personnel, conscripts and the Norwegian Home Guard in full mobilization. An organised military was first assembled in Norway in the 9th century and was early focused around naval warfare. The army was created in 1628 as part of Denmark–Norway, followed by two centuries of regular wars. A Norwegian military was established in 1814, but the military did not see combat until the German occupation of Norway in 1940. Norway abandoned its position as a neutral country in 1949 to become a founding member of the North Atlantic Treaty Organisation (NATO). The Cold War saw a large build-up of air stations and military bases, especially in Northern Norway. Since the 2000s, the military has transformed from a focus on defence from an invasion to a mobile force for international missions. Among European NATO members, the military expenditure of US$7.2 billion is the highest per capita. The formal commander-in-chief is King Harald V; however, the de facto supreme decision-making is made by the Cabinet, led by the Prime Minister. The Chief of Defence (a four-star general or admiral) is the professional heads of the armed forces, and is the principal military adviser to the Minister of Defence. The Chief of Defence and his staff is located at Akershus Fortress in Oslo, while the Norwegian Joint Headquarters, responsible for commanding operations, is located in Bodø. The main naval base is Haakonsvern in Bergen, the main army camps are in Bardu, Målselv and Rena, and the main air station is Ørland. Defence Staff Norway (DEFSTNOR) in Oslo acts as the staff of the Chief of Defence. It is headed by a three-star general or admiral. DEFSTNOR assigns priorities, manages resources, provides force generation and support activities. Each of the four branches of defence is headed by a two-star general/admiral who are subordinate to DEFSTNOR. National Joint Headquarters (NJHQ) located at Reitan, close to Bodø has operational control of Norwegian armed forces worldwide 24/7. It is headed by the Supreme Commander Norwegian Forces – a three-star general or admiral. Norwegian Defence Logistics Organisation (NDLO) at Kolsås outside Oslo is responsible for engineering, procurement, investment, supply, information and communications technology. It is also responsible for maintenance, repair and storage of material. As of March 2016[update], Norway employs a weak form of mandatory military service for men and women. While 63,841 men and women were called in for the examination of persons liable for military service in 2012 (mandatory for men), 9265 were conscripted. In practice recruits are not forced to serve, instead only those who are motivated are selected. In earlier times, up until at least the early 2000s, all men aged 19–44 were subject to mandatory service, with good reasons required to avoid becoming drafted. Since 1985, women have been able to enlist for voluntary service as regular recruits. On 14 June 2013, the Norwegian Parliament voted to extend conscription to women. In 2015 conscription was extended to women making Norway the first NATO member and first European country to make national service compulsory for both men and women. There is a right of conscientious objection. Norwegian Home Guard – 45,000 personnel, rapid reaction forces, follow-on-forces, reinforcement forces and reserves. 6 Skjold class fast missile boats. ^ "The Norwegian Defence Budget for 2014". October 15, 2013. ^ "Military expenditure (% of GDP) - Data". data.worldbank.org. ^ "Norsk lyttestasjon viktig brikke i Falklandskrigen". Retrieved 24 December 2014. ^ "Norske spesialsoldater i Afghanistan: – De vi slåss mot kjemper til døden - Afghanistan - VG". Vg.no. Retrieved 2017-12-14. ^ Czech. "Norwegian Army enters southern Syria to aid endangered rebels at border crossing". Mobile.almasdarnews.com. Retrieved 2017-12-14. ^ Antall kommentarer på artikkelen (NTB) 20.05.2017 21:29 (2017-05-20). "Lokale medier: – Norske soldater er inne i Syria - Syria - VG". Vg.no. Retrieved 2017-12-14. ^ "Norske styrker bisto den afghanske kontraterrorenheten under terror i Kabul - Forsvaret - VG". Vg.no. 2017-07-31. Retrieved 2017-12-14. ^ NRK. "Forsvaret: Norske spesialsoldater bidro i aksjon ved hotell i Kabul". ^ "Kabul-angrepet: Norsk direktør i sikkerhet". ^ a b c Olsen, Tommy; Thormodsen, Marius (June 2014). Forging Norwegian Special Operation Forces (Master's thesis). U.S. Navy Postgraduate School. OCLC 893922200. Retrieved 16 September 2017. ^ "NDF official numbers". NDF. Retrieved 2007-07-16. ^ "Norge har inngått kontrakt om kjøp av fem nye P-8A Poseidon maritime patruljefly". Regjeringen.no. 29 March 2017. ^ "Perfecting the Javelin simulator – the new anti-armor weapon is being phased in this year". Hærens Styrker. 17 March 2009. Archived from the original on 22 May 2009. Retrieved 17 June 2009. Wikimedia Commons has media related to Norwegian Armed Forces. One for all, all for one? New Nordic Defence Partnership? Publication from the Nordic Council of Ministers. Free download. Norwegian and Danish defence policy: A comparative study of the post-Cold War era A historical and comparative study published by the Norwegian Institute for Defence Studies. Free download. The FAMAS is a bullpup-styled assault rifle designed and manufactured in France by MAS located in Saint-Étienne, which is now a member of the French government-owned Nexter group. It is being replaced as the service rifle of the French military by the HK416F. It is known by French troops as Le Clairon due to its distinctive shape. The FAMAS is recognized for its high rate of fire at 1,100 rounds per minute. Marinejegerkommandoen (MJK) is the maritime/naval special warfare unit of the Norwegian Special Operations Command and was established in 1953. A designated marksman rifle (DMR) is the scoped high-precision weapon system used by modern infantries in the designated marksman (DM) role. Although the "sniper" and the "designated marksman" are distinguished by mission and deployment role, rather than by operational range, the DM's role generally fills the engagement range gap between a regular infantryman and a dedicated sniper. DMRs are developed with the mindset to fulfil this middle ground in tactical role. The Heckler & Koch HK416 is a rifle designed and manufactured by Heckler & Koch. Although its design is based on the AR-15 class of weapons, specifically the Colt M4 carbine family issued to the U.S. military, it uses a proprietary short-stroke gas piston system derived from the ArmaLite AR-18. It is the standard assault rifle of the Norwegian Armed Forces, selected by the French Armed Forces to replace the FAMAS, and was the weapon used by SEAL Team Six to kill Osama Bin Laden in 2011. Forsvarets Spesialkommando is a special forces unit of the Norwegian military. It is the armed forces competence centre for commando, airborne and counter terrorist duty in the Norwegian Army. Its headquarters are located 30 kilometres north of Elverum in the southeast of Norway, at Rena leir military base. The FSLK200 was a highly specialized reconnaissance unit of the German Armed Forces (Bundeswehr). It has also been described as a deep reconnaissance company. Forsvarets Spesialkommando (FSK) is a special operations forces unit of the Norwegian Special Operation Forces. The unit was established in 1982 due to the increased risk of terrorist activity against Norwegian interests, including the oil platforms in the North Sea. The CTOE - Centro de Tropas de Operações Especiais, based in Lamego, is a unit of the Portuguese Army with the mission of instructing troops in unconventional warfare and Counter-Terrorism. Until 2006, it was known as CIOE - Centro de Instrução de Operações Especiais. The Heckler & Koch HK417 is a battle rifle designed and manufactured by Heckler & Koch in Germany. It is the larger caliber version of the HK416, and chambered for the full-power 7.62×51mm NATO rifle cartridge. It is a gas-operated, selective fire rifle with a rotating bolt. 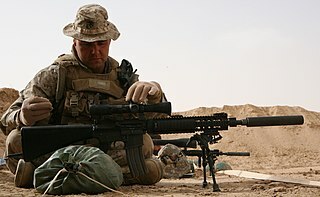 The HK417 is intended for use in roles where the greater penetrative power, stopping power, and range of the 7.62×51mm cartridge are required. It has been adopted for service by a number of armed forces, special forces, and police organizations. The Albanian Joint Forces Command, consists in the branch of the Albanian Armed Forces charged with protecting the territorial integrity of Albania. The Command has under the proper structure the Rapid Reaction Brigade, the Special Operations Battalion (Albania), the Albanian Air Force, the Albanian Naval Defense Forces and the Area Support Brigade.